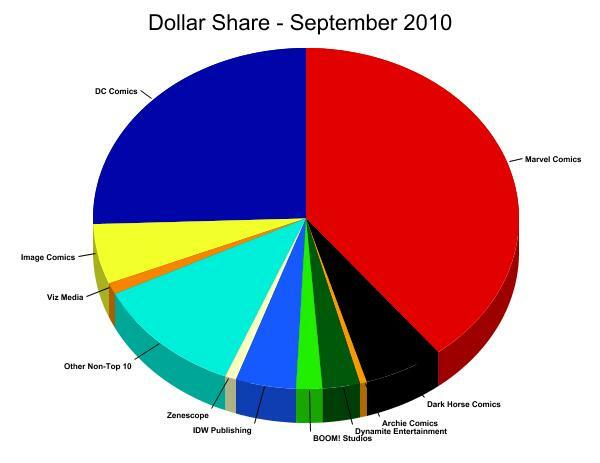 Diamond Comic Distributors released its initial reports for comic-book orders for September 2010, and the last month of the third quarter found Wolverine titles atop both the Top Comic Books and the Top Trade Paperback and Graphic Novels charts. Click to see the rankings and market shares for September 2010. Wolverine #1, the third series relaunch since the 1982 limited series by that name, topped the comics chart, with Wolverine: Old Man Logan leading the list for larger editions. Market shares found Marvel with nearly a 15-point margin over DC in unit sales and closer to a 13-point margin in dollar sales. Diamond's graphic appears below. Diamond's first and second waves of data releases are running more closely together these days; it has just posted the Top 100 Comics and Top 100 Trades pages on its site. Since the third wave, giving us the full Top 300s, will be along shortly, our estimates on those will be the next to appear here. Have cover prices ever gone down?